You know life has changed when you're hanging out with Jane Fonda backstage. There is no greater embodiment of being outspoken on behalf of what you believe in – and being "all in" in every way – than Jane Fonda. And it's a huge honor just to even briefly have shared the stage with her. As one reads these words there is a sense of other-worldly incredulity that she is actually praising 'Hanoi Jane'. But that last line jabs the barb firmly in place and twists it. The general story today in the main-stream media is that she later apologized, in a Barbara Walters interview in 1988 and in 2005 in her autobiography, saying that she was "thoughtless and careless" about "things that [she] said or did" and later, as to the photograph, claimed that she was an "emotional wreck" at the time, and that "It was possible that it was a set-up, that the [North] Vietnamese had it all planned." This has been used by the Left to put some sort of finality to the subject – a "Get over it" attitude to her critics – as an apology for all of her actions. Examine her claims though; she addresses the photograph almost exclusively, mostly as bad PR for herself, and parses her words carefully about the rest of her extreme statements. Unfortunately, some stories have sprouted up about Fonda's willing collaboration that frankly aren't true, and they have done her opposition no good whatsoever. These stories are used in the tried and true fashion of finding one small element that is askew and then use that to impeach the entire story, allowing the Left and the press (but I repeat myself) to ignore it henceforth. - She made some ten broadcasts over Radio Hanoi, condemning Americans as war criminals. Her defenders argue that the 'Hanoi Jane' label is harsh, but she actually made the broadcasts and truly deserves the moniker just as surely as Tokyo Rose and Axis Sally. - She took up the cry and became the poster child for the claim that the US was deliberately bombing the dikes in and around Hanoi in an effort to flood the area and target civilians. There was no such operation but the propaganda campaign persisted nonetheless, aided by occasional foreign diplomats. 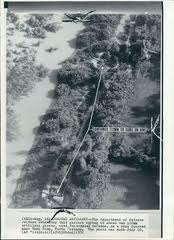 Dismissing the obvious case of fighters jettisoning their bomb loads during maneuvers and the stray bomb off target, the major defense against the claim was that if the US had sought to eliminate the dike systems, it would have done a far more credible job of it. The US also cited examples of anti-aircraft emplacements being built on dikes in coordination with the propaganda campaign, but she proclaimed that it was a lie, up until the point when we took the unprecedented step of publishing classified photos of such sites. - With our troops in the field, Fonda often said that what Viet Nam really needed was a "victory for the Viet Cong." - When our POWs returned with stories of torture, Fonda called them "hypocrites and liars". When later called to task for her remarks in the face of irrefutable proof, she backtracked by saying that whatever torture that might have occurred could not have been "systematic", and thus the claims of the POWs were still lies. She went on to insist that they were nevertheless "professional killers" and "war criminals". Fonda's two cases of her qualified 'apologies' both occurred with a mercenary sense of timing during movie projects and book tours that were coming under increasing pressure from veterans groups. 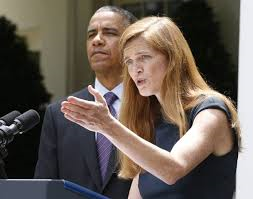 This is the example that Irish-born Samantha Power edifies, and it is no surprise that she feels comfortable in her presence. Power first hit the national news circuit as an Obama wonkette during the 2008 presidential campaign, when in a fit of pique in what she thought was an off-mike moment, condemned then-rival Hillary Clinton as a "monster" who would "do anything" after she had capitalized on the fact that the Obama campaign had "fucked up in Ohio", as Power condemned the voters in Ohio as well. She was publically dismissed from the campaign but didn't stray far, remaining as the ex officio human rights advisor and married to Cass Sunstein, one of Obama's retinue of czars. After the dust settled from the campaign, she was promptly brought back onboard and made her amends with Hillary. Of course, that same blithering misunderstanding of whatever goals we have in Libya has resulted in that country being the new Somalia, and led to the attack on our consulate in Benghazi. Power has a strained relationship with Israel, which helps her fit in with the current White House staff. She has called for a 'legitimate' use of US power by providing a "mammoth protection force" into Israel to prevent "actual genocides" and "major human rights abuses" by both Israel and the Palestinians. We have to put "something on the line" to impose a "solution on unwilling parties". This is an example of the fundamental shift in our relationship with Israel, no longer spoken of as an ally, and she implied in a 2007 interview that we had brought the 2001 attacks on ourselves by acquiescing in Israel's "human rights abuses". It isn't only Israel, of course. She argued that, like former German Chancellor Willy Brandt apologizing for the atrocities of the Nazis, we too should have "a historical reckoning with crimes committed, sponsored, or permitted by the United States." She is one of the originals after 9/11 who literally asked "Why do they hate us?" Is it any wonder that Power so blithely gushed about someone so rightfully vilified outside the clutch of the lumpenintelligentsia? Powers must feel right at home with the other totalitarians. Fonda is just icing on that cake. Three more years. At least President Wormtongue will be preoccupied with trying to fix OBummerCare. That should help slow his disarmament plans and actions. Israel, fortunately, can take care of itself.